Taking inspiration from trees, scientists have developed a battery made from a sliver of wood coated with tin that shows promise for becoming a tiny, long-lasting, efficient and environmentally friendly energy source. Their report on the device—1,000 times thinner than a sheet of paper—appears in the journal Nano Letters. But don't try it at home yet– the components in the battery tested by scientists at the University of Maryland are a thousand times thinner than a piece of paper. Using sodium instead of lithium, as many rechargeable batteries do, makes the battery environmentally benign. Sodium doesn't store energy as efficiently as lithium, so you won't see this battery in your cell phone—instead, its low cost and common materials would make it ideal to store huge amounts of energy at once – such as solar energy at a power plant. "The inspiration behind the idea comes from the trees," said Hu, an assistant professor of materials science. "Wood fibers that make up a tree once held mineral-rich water, and so are ideal for storing liquid electrolytes, making them not only the base but an active part of the battery." Lead author Hongli Zhu and other team members noticed that after charging and discharging the battery hundreds of times, the wood ended up wrinkled but intact. Computer models showed that that the wrinkles effectively relax the stress in the battery during charging and recharging, so that the battery can survive many cycles. "Pushing sodium ions through tin anodes often weaken the tin's connection to its base material," said Li, an associate professor of mechanical engineering. "But the wood fibers are soft enough to serve as a mechanical buffer, and thus can accommodate tin's changes. This is the key to our long-lasting sodium-ion batteries." Sodium (Na)-ion batteries offer an attractive option for low cost grid scale storage due to the abundance of Na. Tin (Sn) is touted as a high capacity anode for Na-ion batteries with a high theoretical capacity of 847 mAh/g, but it has several limitations such as large volume expansion with cycling, slow kinetics, and unstable solid electrolyte interphase (SEI) formation. In this article, we demonstrate that an anode consisting of a Sn thin film deposited on a hierarchical wood fiber substrate simultaneously addresses all the challenges associated with Sn anodes. 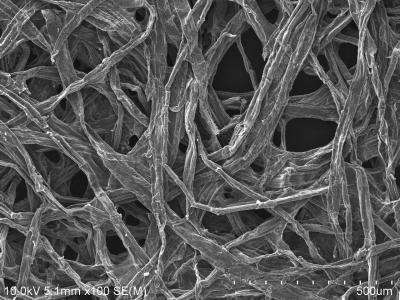 The soft nature of wood fibers effectively releases the mechanical stresses associated with the sodiation process, and the mesoporous structure functions as an electrolyte reservoir that allows for ion transport through the outer and inner surface of the fiber. These properties are confirmed experimentally and computationally. A stable cycling performance of 400 cycles with an initial capacity of 339 mAh/g is demonstrated; a significant improvement over other reported Sn nanostructures. The soft and mesoporous wood fiber substrate can be utilized as a new platform for low cost Na-ion batteries. why don't people worry about the important stuff, like making environmentally friendly™© volcanoes, tsunamis and asteroids? It is obvious. Plain as simple day, the previous posters didn't even read the abstract. This is way cool and I'm glad somebody is pursuing the idea, instead of just bitching like some people!